Fullabrook CIC announced on Wednesday that they are happy to support Barnstaple Pilot Gig Club’s application for funds towards the cost of purchasing the warehouse on Rolle Quay adjacent to the Sea Cadets compound, for use as a Watersports Centre. Fullabrook CIC have pledged £34,000, which, when added to funds already raised, exceeds 25% of the purchase price. 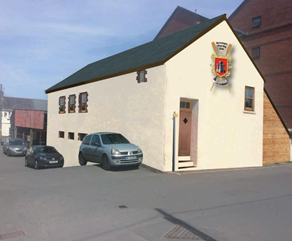 Barnstaple Pilot Club intend to refurbish the building for use as a boathouse and equipment store on the ground floor level, and as a spacious club room on the first floor level. The latter will be made available to any other organisation needing a meeting place in central Barnstaple as needed. Planning permission has already been obtained for change of use, and initial drawings prepared by Peregrine Mear’s Architectural practise for refurbishing the building, including proper access for the disabled, new toilet facilities and a spectacular hall on the first floor level. 5th August Duck Race and Car Boot sale at Barnstaple Cricket Club. The Duck Race will be on the River Yeo along the Cricket Club boundary, starting at 12.00 noon on the day, and ducks can be bought for £1 each. First prize will be £50, 2nd prize a voucher from TK MAX for £30, and third prize is lunch for two at Green Lanes Café. The Car Boot sale will start at 9.00am for sellers (£5 per pitch) and 10.00am for buyers. There will also be a raffle and cake stall, and there will be a bar and food at the Cricket Club house. Contact Steve on 07599 771090 to book a pitch. 15th September BPGC’s second Dragon Boat Racing festival – contact David Dixon (davidcharlesd@yahoo.co.uk). 30th September Six club members rowing the Marathon distance on rowing machines in Rock Park while Barnstaple Marathon is underway. 22nd September Pirate Gig Nipper is entered into Barnstaple carnival.